I have been a long time fan of Old Orchard’s line of premium organic juices that I give to my children diluted with water. I don’t drink a lot of juice myself because of the sugar content and I refuse to drink artificially flavored juices. Therefore, I was thrilled to discover the Old Orchard has a new line of Cranberry Naturals that is 30% juice which is naturally sweetened with a blend of sugar and Truvia™ (a sweetener based from stevia). The result is a naturally delicious reduced calorie juice that has allowed me to enjoy it once again. There are no artificial colors, preservatives, flavors or high fructose corn syrup. There are six fantastic flavors to try including Classic Cranberry, Cranberry Apple, Cranberry Grape, Cranberry Raspberry, Cranberry Blueberry and Cranberry Pomegranate. I had the opportunity to try the Classic Cranberry and it has a wonderful distinctive cranberry taste with a perfect blend of tart and sweet and there was no detectable “diet” taste since it is naturally sweetened. I have been a fan of stevia for sweetening for years and was really excited to see that it has been introduced by Old Orchard Juices in their newest line of juice. The real test was my husband who refuses to drink any beverage sweetened with anything other than real sugar and without my informing him that it was sweetened with a sugar and Truvia™ blend he declared it “delicious” after drinking his first glass. 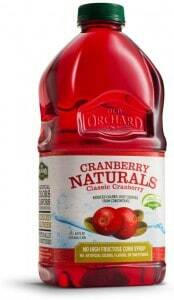 “Bravo” to Old Orchard for the new Cranberry Naturals and I can’t wait to taste all of the new flavors in this new line. To learn more you are invited to visit the Old Orchard Website. Connect with Old Orchard on Facebook and Twitter. In addition to the above, Old Orchard refuses to allow fluoride in their water. Cheers to an honest and ethical company who cares about their consumers to keep deadly poison out of their products and will not sell out to the government! Have had Old Orchard products and enjoyed them. I too do not like artificial sweeteners or overly sweetened juices. Their products fill the bill.